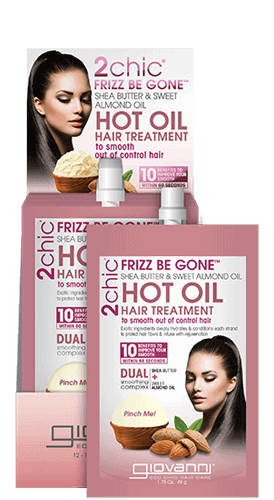 2chic® Frizz Be Gone™ smooths and deeply moisturizes hair that tends to frizz. The collection is charged with our Dual Complex of Shea Butter and Sweet Almond Oil that provides the moisture needed to restore and reduce frizz and bring back those soft bouncy curls. Your satisfaction is guaranteed! A powerful mix of Shea Butter, Sweet Almond, Macadamia, Argan, Baobab, Moringa, Jojoba, and Coconut Oils wrap every strand in ultimate hydration while conquering even the most rebellious frizz. Define your style with a professional finish with new styling products that leave tresses polished, shiny, smooth, and controlled without weighing down curls. Frizz Be Gone™ products are sulfate-free and paraben-free. We don’t add harsh chemicals, or artificial dyes, and it’s always cruelty-free.